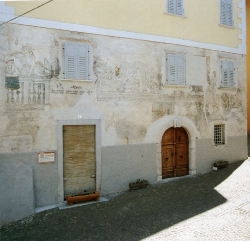 The township of Fondo presents in the most picturesque and on the facades of older houses a cycle of votive frescoes dedicated to St. James. 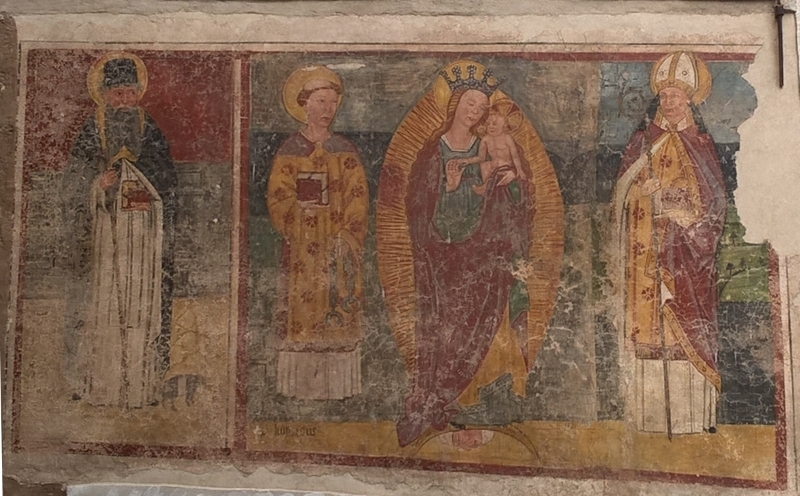 The frescoes dating back to the 1400s symbolize the gratitude of seven families in the village fled to a plague epidemic. Unfortunately over the years as well as a significant and profound loss of much of this heritage it has also found a gap in the memory of the population in relation to this dramatic event. The information is still scarce and confusing. 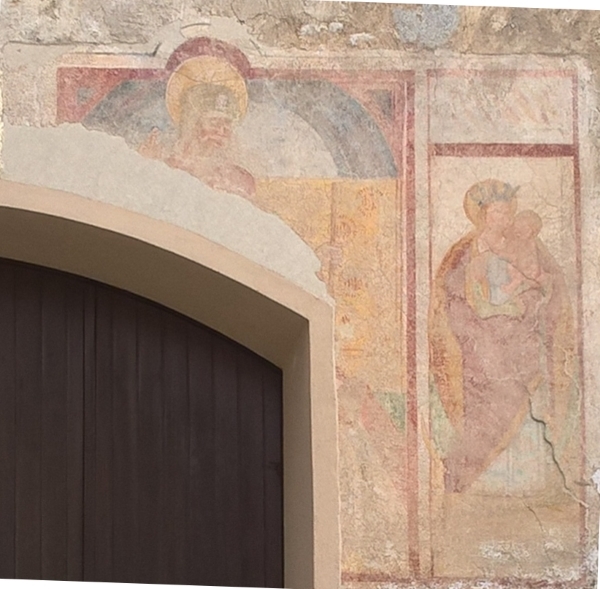 Here on this page, the information known about the various frescoes discovered on the facades of the oldest houses in the country. On the facade of a house in Lampi Go away and Rocco is one of the five images is Santiago de Compostela that are in the Fund. The fresco is not healthy because mutilated by the opening of a new window in the house. It remains intact figure of the devout, while the saint is still visible only the left side. 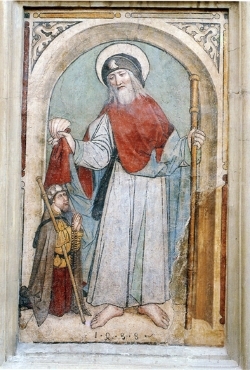 St. James is portrayed here in the front to the customer kneeling at his feet: the two characters are wearing dresses and recono wanderer, as a hallmark of the journey to Compostela, a shell in his hat, according to the custom of the time. In the background arch it is partly hidden by a yellow cloth richly decorated. The checkerboard floor is prospective. 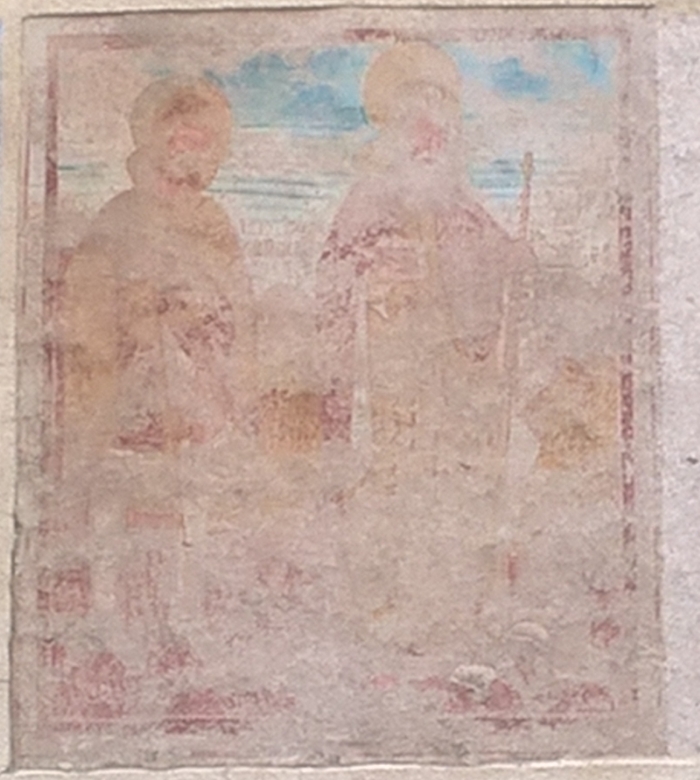 The painting is in poor condition, the image remains legible, but only in part, the person of the Holy as in other representations appears front and take the right hand shell symbol of the pilgrimage to Santiago de Compostela. The Saint is in a niche closed in the background by a pink wall ashlar plate. 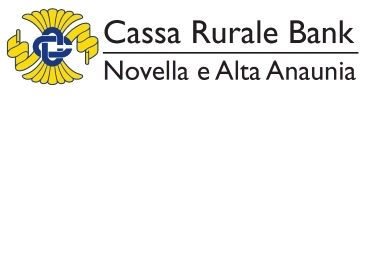 The work has been attributed to the same artist who worked on the implementation of the fresco of St. James Street at the intersection of Thunder and San Rocco. Other frescoes are on the church of Santa Lucia.